SETDA has updated its free tool for helping schools implement digital curriculum. The latest updates to the Digital Instructional Materials Acquisition Policies for States (DMAPS) are intended to clarify state policies and practices. 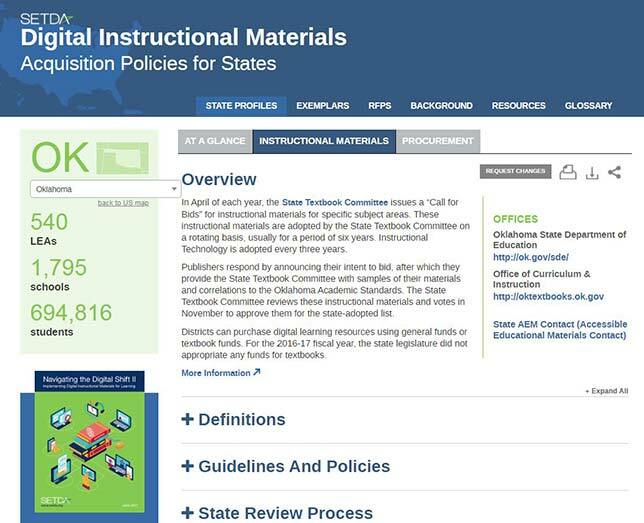 The State Educational Technology Directors Association originally launched DMAPS in 2015 to help educators, policymakers and people in industry understand each state's policies and practices related to instructional materials, as part of helping to promote increased implementation of digital resources. The new edition lets state and district people share their best practices and options "related to adoption and implementation of tools and resources to support learning in the digital age," explained Executive Director Tracy Weeks. According to the organization, updates include "snapshot" overviews of policies and practices of state procurement, the instructional material review process for each state, accessibility policies, details related to adoption and implementation, coverage of state trends and the ability to compare states. The interactive tool covers every state as well as the District of Columbia and Guam. One supporter for the site is Utah, where the state has "mandated the review of educational curriculum since 1907, and has recently formed a Digital Teaching and Learning Team to support the integration of technology into our schools," according to Sydnee Dickson, state superintendent of public instruction. "SETDA's DMAPS project has informed our instructional materials review process and has helped Utah incorporate the latest and best materials available for digital learning," she said in a prepared statement. This work was supported by the Bill & Melinda Gates Foundation.